Wow…. did we ever get bounced around by the wind last night. Jan claimed to have received very little sleep whereas there isn’t much I won’t sleep through. Temperatures have been very mild so we decided to turn off the Refleks stove and rely on the Hurricane. It seems a logical move. The Refleks can run 24/7 when it’s sufficiently cold to warrant a continuous source of heat. In milder weather the thermostatically controlled Hurricane can switch on/off as required. Hopefully this strategy results in less fuel being burned. Some essential supplies have started to run low so it was yet another trip into Newbury. Whilst it’s a nice town we didn’t come to the UK to live near Newbury. However there’s not much we can do about the situation but accept we will have to wait until conditions change and we can move on. After receiving the following email from CaRT it doesn’t appear this is likely to happen in the near future. 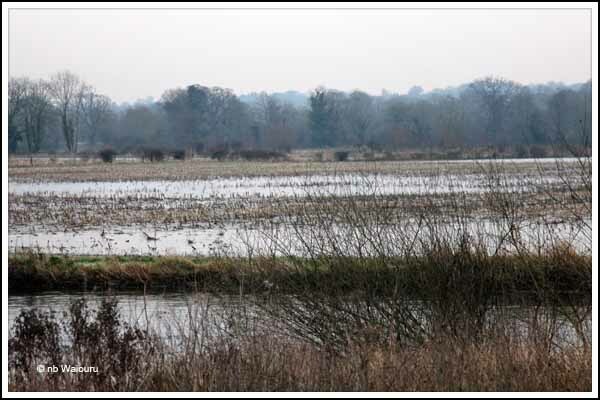 Heavy rain is forecast toward the end of the week (1 February)that is likely to cause difficulties to navigation and may make the river sections (the River Kennet and the River Avon)of the waterway impassable. The Waterway Manager does not recommend navigation in these conditions. Whilst in Newbury we were fortunate enough to be able to visit Bill (Towpath Bill) in his new apartment. Bill is a very interesting character and always manages to surprise us with some nugget of canal information. 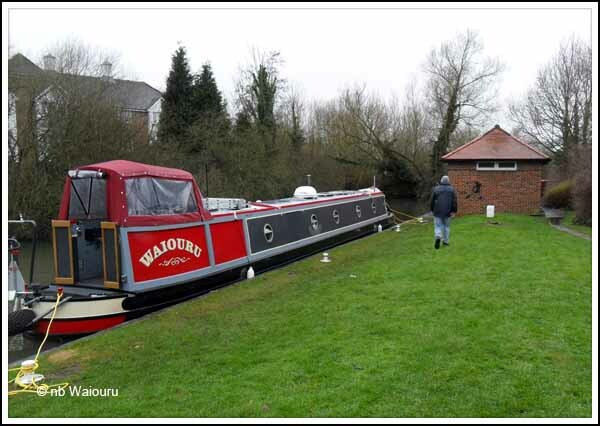 He has suggested a return towpath walk from Newbury to Hungerford this Sunday. I shall have to watch the weather before deciding to take up his offer! Back at Waiouru and the TV reception was awful….. nothing but “soapies”! Then I realised I was watching the washing machine. Jan had decided to do the socks and “smalls” knowing we plan to fill the water tank in the morning. I’m still struggling working out the intricacies of the Empirbus User configurable TEXT communications. It would appear I have the physical wiring correct, but the software configuration is challenging the old ‘grey matter’. Fortunately I’m receiving excellent support from Atlantis Marine. My feeling is that I’m almost there……… Or perhaps I’m so lost I think I’m found. The saga with the mobile phone network provider continues. Last time I went to the store in Reading they arranged for my user account on their website to be deleted as I thought the problem was it had been corrupted when I had a network outage during the creation process. I was told to wait 3 days and re-create the account. Last night I tried and the system again reported an error. My guess is it’s still a problem with the SIM card number. One part of the mobile phone providers system allows the SIM to work (the SIM will send and receive), however there is another part that believes the SIM number is inactive. My assumption is it’s this half of the system that is preventing me from registering the mobile phone number on the website. Today I went into the store at Newbury and explained the problem. They told me there was nothing they could do about a problem with the website account and I’d have to contact ‘Customer Care’. You may recall last time I tried communicating with Customer Care three different “carers” told me the SIM was inactive and the phone number had been recycled. It looks like I’m back full circle! No photos today as the internet is sloooooowwwww! Overnight an email arrived from Brisbane with answers to the questions I’d asked of the supplier of the automatic battery watering system. The major question was of the minimum ‘head’ the system required between the batteries and the tank. The ‘head’ is the difference in height between the tank and the top of the batteries. The greater the head the higher the water pressure (which is why there are water towers). It wasn’t an optimistic reply as the “official” minimum head is 1.5 metres. At that height I’d need to secure the tank to a mast! The supplied tank has a capacity of 20 litres which is probably fine in a static environment but is too big for the cockpit locker on Waiouru. The supplier went on to explain that ‘unofficially’ the system had been known to work with a 6 inch head. Moreover there is another option. 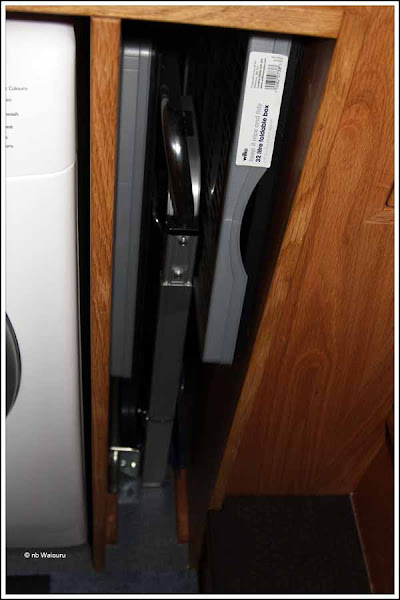 The system can be pressurized by connecting a bicycle pump to the sealed header tank. A return email has now been sent with some additional questions. However it’s likely we would only purchase the battery caps and look on eBay for a suitable automotive radiator header tank. I’d try it as a gravity feed system with a natural 6-8” head and if that didn’t work then I’d make the header tank into a pressurized system. We would probably only need to pressurize the system on a weekly basis. Thoughts have also turned to what other cruising equipment is required. In four hireboat holidays we’ve (me) only twice had to go down the weed hatch becoming the owners of a fishing net and a religious (holey) grey T-shirt. 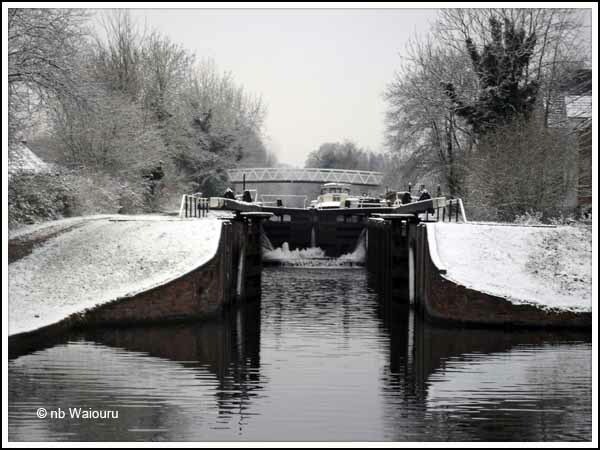 But you only have to read other boaters blogs to realise we might just have been lucky. Obviously we don’t want to buy something expensive; although I did research ‘cutters’ that can be fitted to the prop shaft. It seems anything with ‘boat’ included in the name is expensive so the net has been cast wider. 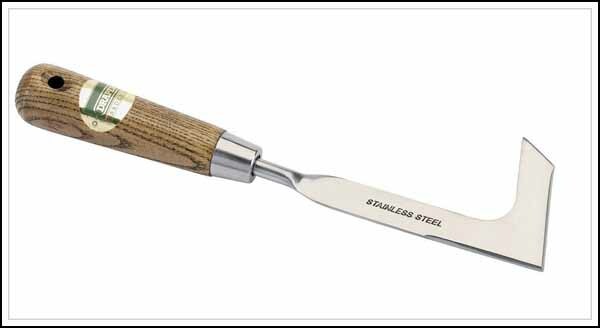 Of course there is always Jan’s expensive bread knife but using that might also include subsequent gelding! Current thinking is to purchase a patio paver weed cutter. Some modification would probably be required. All the steel edges on the blade need to be sharpened and a longer handle to get down the weed hatch without having to immerse my beautiful soft pink hands in the dirty and freezing canal water. The back of the blade could be used for cutting and the hook for pulling and ripping. Of course this is all theory on my part and there may be far superior options! 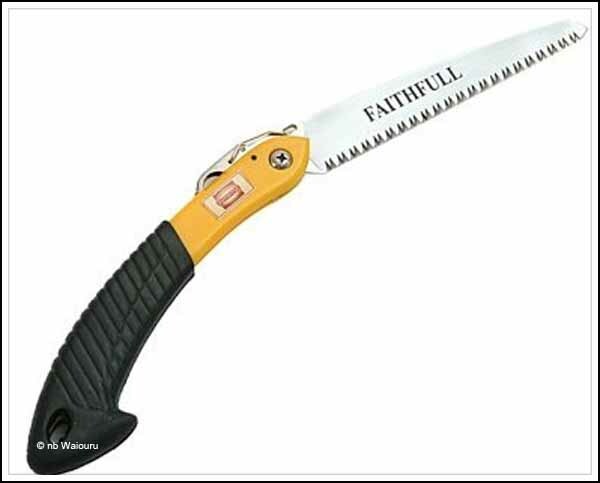 The other tool is a small folding saw. Probably useful for cutting any timber caught around the propeller but more likely to be used to trim back branches when attempting to moor up in some obscure and overgrown location. Moses…. did it ever rain last night! Unlike me, Jan couldn’t sleep and eventually went off to the saloon whilst I slumbered on. Eventually she decided to walk me a 7:30am by creeping back to bed and placing her cold feet on my lovely warm back. The day appeared to be shaping up to be very miserable when to our surprise around 9.00am the sky cleared and the sun appeared. It was still rather cold and windy but this didn’t prevent me from taking a long walk. 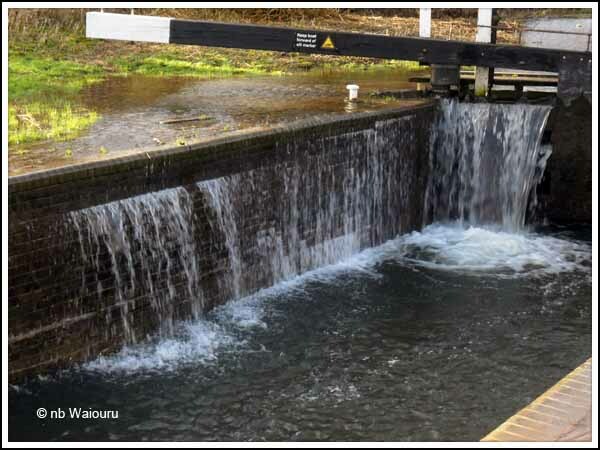 There is a problem with Widmead Lock near Thatcham and it can only be transited on Wednesday’s with the assistance of CaRT. So I walked to the lock to get a better idea of the problem. There is a significant volume of surface ground water either side of the canal and the river is running quite fast. 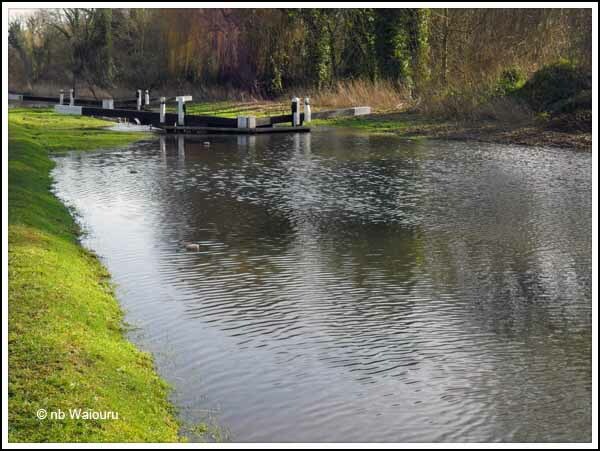 Widmead Lock – Water over the upstream gates and the landing is flooded. The tops of the landing bollards are just visible. Now for what might be more positive news. The domestic battery bank is under the stern counter and it’s rather hard to check the electrolyte levels so I started searching for an automatic top-up system. The price of them was frankly… frightening! £200+ for 12 cells. Our net has been cast wider. No joy in Canada or the USA! But to my astonishment we may have stumbled upon a supplier in Brisbane, Australia. The price quoted for the system is A$148 works out at around £90 (plus postage). I’ve written back with a query regarding the minimum height of the header tank and if that answer is satisfactory we may have a solution to managing the electrolyte levels. Now to more mundane boat matters. 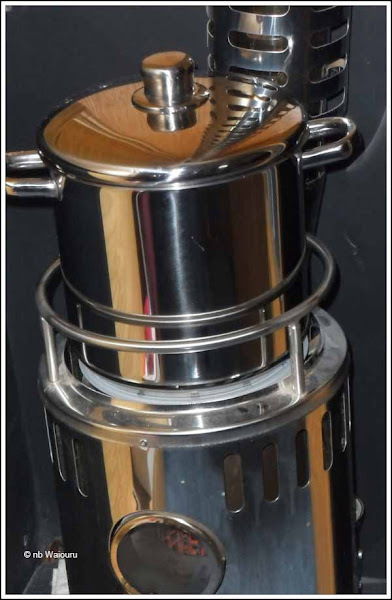 We’ve been thinking about whether the external section of the flue on the Refleks stove is at risk of getting damaged when cruising. 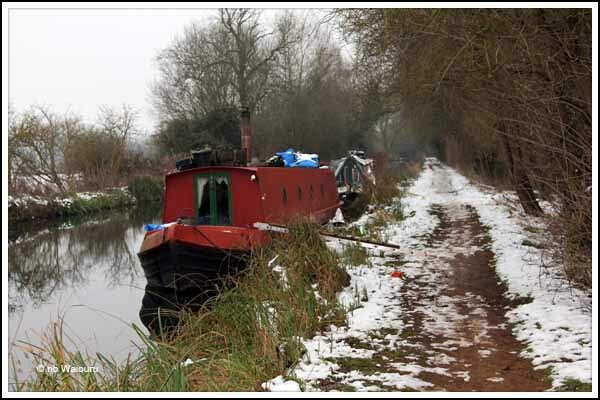 Logic tells us there is a risk which appears to be confirmed by the number of moored and unoccupied boats that have the flue/chimney removed. If the top section of the flue is removed then we obviously need to place some type of cap over it to prevent rain, wind and debris going down the exposed hole. After asking advice we opted to fit a steel paint pot over the top and and after a trip to B&Q on Wednesday (to be eligible for the seniors 10% discount) we now own a suitable pot. The pot needs some modification. First the wire handle and steel brackets needed to be removed otherwise they may scratch the roof paintwork. This was achieved using an angle grinder. The pot fits nicely over the top of the flue however I was concerned it might be blown or knocked off. The logical solution (to me) was to make it heavier and lower the centre of gravity. We have 400mm of spare 8mm galvanised chain left over from the construction of the gas locker. 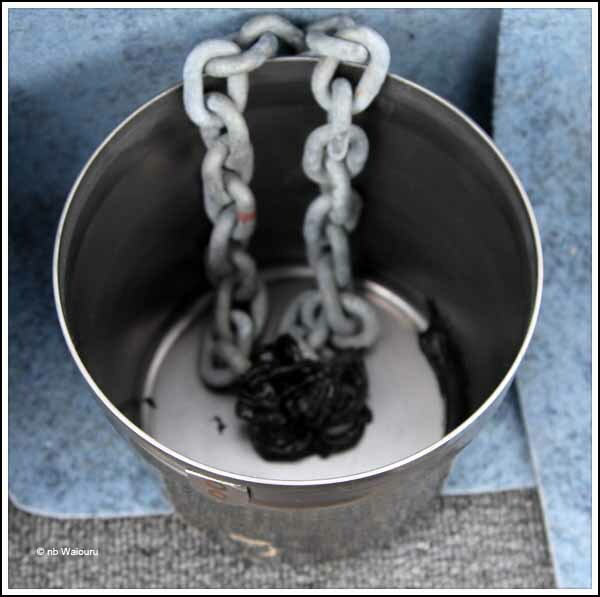 The original chain was used to secure the gas cylinders upright and prevent them moving around in the locker. The ends of the 400mm length of chain have been secured to the inside base of the pot with construction adhesive (because that’s all I had). Hopefully the chain will hang down inside the flue lowering the cap centre of gravity. The chain will store in the base of the cap when it’s not being used. Well that’s the theory. I’m now looking for an offcut of plastic beading which will be used to fit it around the rim of the pot thereby protect the paint on the roof (I hope!). If the adhesive doesn’t hold the chain I suppose it will be ‘Plan B’……. drill a hole and bolt the chain to the base. 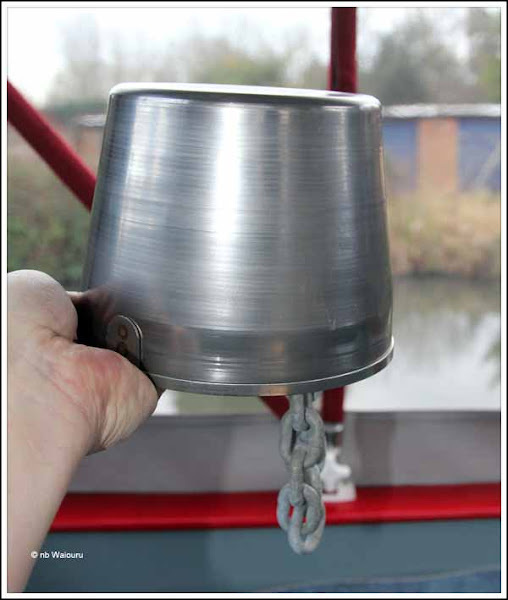 It’s also likely I’ll have to sleeve the chain to prevent it rattling inside the flue. After that there was an opportunity to muck around do some serious work in the garden shed engine bay. After rearranging the consumables there was a small amount of spare room for the second left over can of paint. The battery and coolant hydrometers fitted under the hospital silencer and I was able to winterize the shower hose on the stern by draining it down, disconnecting it and fitting the winter plug. Tomorrow I need to familiarize myself with our new syphon hose before it gets stored in the garden shed. It was a rather casual day with Jan doing significantly more than me. She baked a lemon drizzle cake in anticipation of Bill’s visit tomorrow. Do I have to share??? Some unusual and unexplained urge had me retrieve the vacuum cleaner hoover from the base of the wet locker and hoover vacuum the floors. Jan did point out afterwards that I should have dusted all the shelves and cleaned the two recliner chairs before playing with the vacuum cleaner. But I’m not domesticated so she shouldn’t be that surprised! Meanwhile the marina staff struggled to remove the inflatable paint tent off the completed boat and move it over the adjacent boat which is the next to be painted. 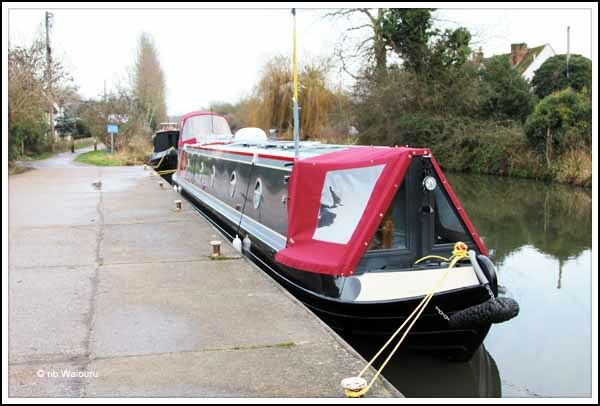 After painting this next boat Darren has two hire boats to paint in time for the 2013 season. He’s going to be a busy man! Later in the afternoon I went for a walk. Back at Waiouru we received a text message from…… ME! What I’ve done is to use Google Calendar to create time based events for maintenance on Waiouru. Google then sends us a text or email reminder to complete the work. So tomorrow it’s back to the garden shed to do the monthly check on the Hurricane heater. <a href=http://mastercrafting.wordpress.com/2012/09/17/the-blanket-that-makes-itself.html>link here</a> All you should see in the published comment is link here and if the word/phrase is clicked you should be taken to the linked website. We woke this morning to find the canal iced over. Whilst it was warm under the duvet Jan suffered slightly when she was “nudged” from the bed. I hung around in the warm bed waiting for a cup of tea and digestive biscuit. Lucky I didn’t hold my breath! We now appear to be having email correspondence with three separate representatives from the mobile phone provider. They all have Indian continent names (am I communicating with Bombay?) and each is providing a slightly different explanation to a problem I don’t have. There are two things they all agree about. Our SIM card has been deactivated and the number reallocated. None of them have answered my actual query about our inability to login to their website. I could see if I kept feeding caviar to the donkeys I was going to continue to get s!*$. I’ve no desire to keep mucking out the stables so a change in approach was necessary. Today I made a trip back to the store in Reading where I purchased the SIM card on 20 December last year. This is getting to be an expensive £5 SIM card! Before leaving I once again removed the SIM card from the communications module and inserted it into the spare phone. We then tested the card to reconfirm it is active (it was). The bus was 25 minutes late and I was half frozen by the time it arrived. I don’t know why it was so late given they run every 30 minutes. Anyway I arrived at the shop in time to join the queue. Eventually those before me (and after me!) were served. Perhaps I shouldn’t have given a brief synopsis of the situation when I arrived! Eventually poor Jeremy was ordered to handle my problem. He confirmed the SIM card was active and I was then able to explain my query was about accessing their website. Jeremy volunteered the information that their website had been “down” on the weekend during the time I had been attempting to create an account. I suggested to him my account had perhaps been corrupted by this system failure. And that’s what had happened! So the account has been deleted and we’ve been advised to recreate it in three days. I’m optimistic the problem may be solved. Back at the boat Jan had cooked both a peach sponge pudding and our financials. I’ll eat the former but leave the latter to the family financial controller. 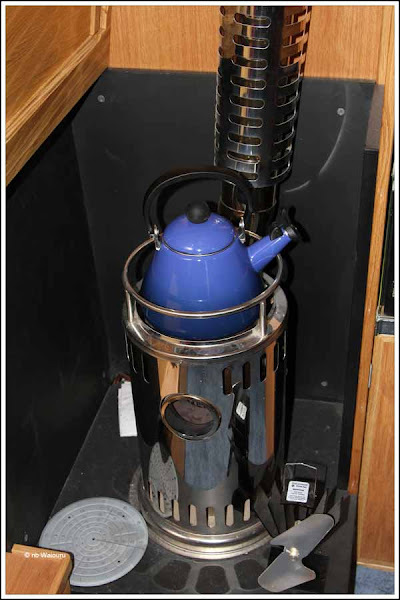 She has also been onto the internet and purchased a kettle with the right diameter base to fit on top of the Refleks stove hotplate. By the time I made it back to Waiouru there was the delicious smell of fresh baking in the air. I’ve almost finished the walnut and date loaf. It’s been a challenge trying to eat all of it before the mould gets in on the action <burp…>. Now Jan tells me she will be baking lemon drizzle cake using the lemons she purchased in “Smelly Alley” whilst we were in Reading on Monday. I need to do more walking! Today we caught the Jet Black bus from Aldermaston but for a change went to Reading and did some window shopping. Neither of us are good window shoppers, we like to have a clear objective rather than just browsing. To enforce some motivation we decided to look for a suitable kettle for the top of the Refleks stove and some crates to fit onto the folding sack trolley. Success with the latter but only an idea for the former. It’s interesting to realise how focussed you get about being a minimalist when it comes to possessions living on a boat. 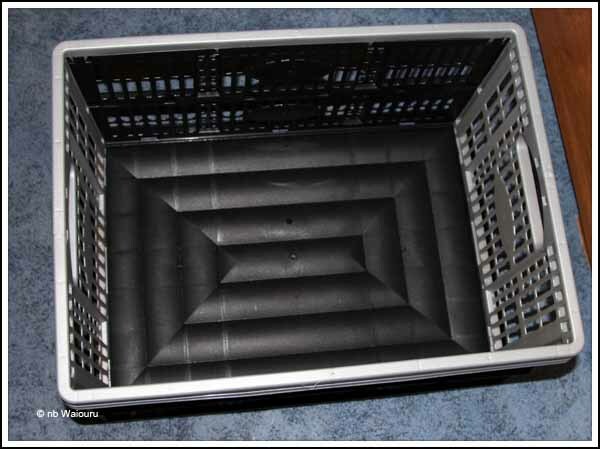 We previously searched very thoroughly to find a suitable folding sack trolley which was low cost, robust, and would fit into the available small alcove. Jan has also recognised there will be times when large delivers of groceries will have to be carried back to Waiouru. Rather than develop arms of a gorilla we’re going to attempt to use the sack trolley. But the plastic and canvas bags don’t sit all that well on the “toe” of the trolley. We need something that is both rigid and doesn’t take up much room. We may have found the solution. Jan found these in Wilkinsons. It’s a plastic crate rated at 12kg and she purchased two. They both fit into the sack trolley alcove and have actually stopped it rattling. 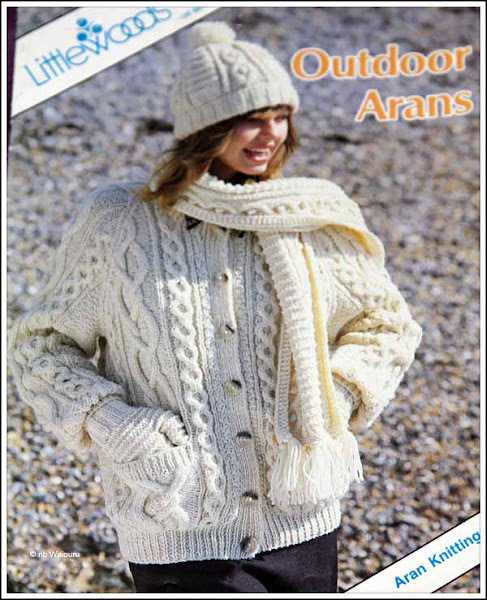 This is Jan’s second attempt as she wasn’t satisfied with her first effort. 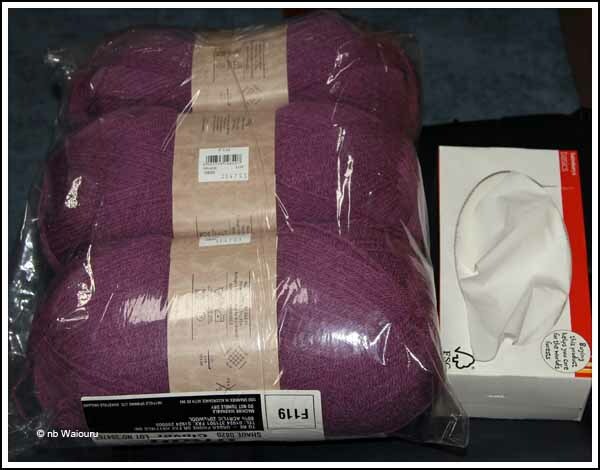 Notice the colours of the wool Marian sent Jan are the same as Waiouru! Thank you Marian…….. The last thing I will mention is there has been a rather odious smell in the boat during the last 24 hours. I didn’t want to give offence so kept my opinion to myself. However Jan took off one of her slippers and gave it a sniff before replacing it. She subsequently told me she though the smell was coming from me (I don’t know why she’d think that?). In the end she realised the contents of the galley rubbish bin had started to ferment in the warmth of the cabin. Nice to know I don’t have a personal hygiene problem! Sometimes I would just love to send an invoice to service provider companies for all the time I spend trying to rectify their problems! The latest issue with our second mobile phone network company <grrrr>. Regular readers will know Waiouru has a communications module which is capable of sending information and receiving commands. This is done via a mobile phone SIM card which has to be fitted into the module. Back on 20 December 2013 we purchased a £5 pre-paid SIM card and fitted it into the module. Since then the boat has been sending us text messages about the status of the on-board systems. Under the terms of the supply agreement the SIM has to be used at least once every 30 days otherwise it expires. Additionally the £5 has to be topped up when it gets low. The mobile phone provider’s system will automatically send a warning notice by text message to the phone when that is about to occur. Unfortunately this is no use to us as the SIM is in the module and will ignore non standard messages. I wrote to the mobile phone provider asking if the message could be sent to our other mobile phone (the voice phone which we monitor). They replied informing us it was not possible to have the message sent to an alternative phone but I could check the outstanding amount on the phone by creating an online account. They even provided the internet link. So I attempted to create an account. As part of the process the website wanted our email address, which I provided. At the end of the process their website said there was an error and to resubmit the data. I re-entered the data <another error>. I re-entered it a third time and this time I was told the email address was already being used. This confused me and I assumed it was because we already have an account with the same provider back in Australia. So I then used our backup email address as the UserID. Another error message <grrrrrrrr>. Then we receive a system generated email from the provider stating the account had been established using the original email address. I then attempted to login to the account. Another error message. Frustration level was going through the roof so I wrote comprehensive email to the mobile phone providers “Helpdesk”. This afternoon we received an email reply which didn’t answer any of my queries. The email stated that the SIM had been de-activated because under the conditions of sale and use the SIM had to be used within the first 90 days or it would be deactivated, Additionally, the remaining cash on the SIM was forfeit. The email went on to state that unfortunately they couldn’t reactivate the SIM. Two things immediately came to mind…. Today is 20 Jan 2013………Card purchased 20 Dec 2012 + 90 days?????? The damned card isn’t older than 90 days!!!!!!!! The card HAS been used. I have all the text messages from it on my other mobile phone. So I went to our normal phone and sent the boat communications module two text queries. AND PROMPTLY RECEIVED TWO RESPONSES. The card is still active!!!!! But I still can’t login to our account on their website. So I’ve had to send yet another email attempting to get them to fix the website access problem. Why do I feel like I’m feeding bucket loads of caviar to a donkey! Opened one eye at 7:30am to see Jan looking up at the snowflakes falling on the glass in the Houdini hatch. Waiouru was lovely and warm despite the Refleks being set slightly below 1 on the settings. I don’t think we can set it much lower without cutting off the fuel. After a good breakfast of hot porridge with brown sugar and yogurt I sent Jan out to assess the conditions! She eventually returned through the white swirling flakes to report the back deck needed to be cleared of snow as it was building up against the rear doors. Jan told me she couldn’t see the broom on the roof of Waiouru and thought it was out of reach on the far side. Obviously it was my time to get into the jacket, scarf, gloves and beanie. The broom was on the near side but covered in snow. Sweeping the snow of the deck took very little time although I did note within 5 minutes there was a layer of snow back on it. This cheeky fellow has been hanging around Paul’s boat. I decided to make the weekly long walk today as I have a project meeting with Andy tomorrow morning. 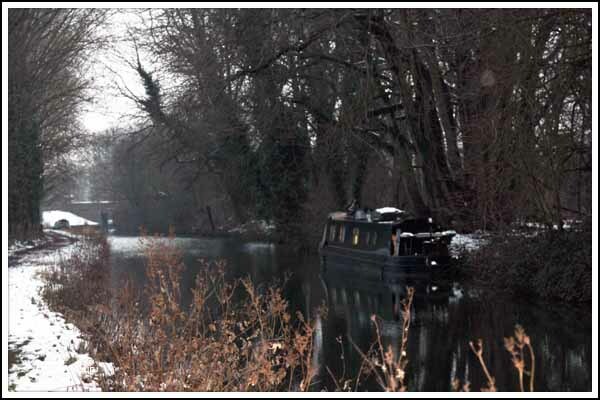 After considering a number of options the plan was to walk east down the towpath towards Reading and halfway divert through Theale to the Sainsburys at Calcot where Jan had asked me to purchase a loaf of bread. 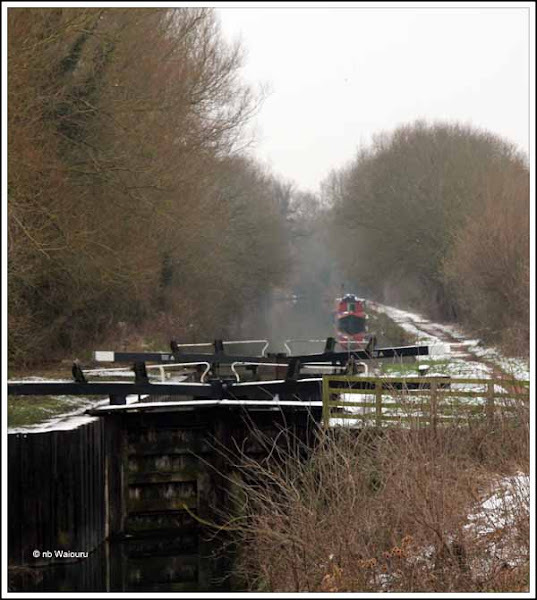 I’d then cross Calcot and into the Linear Park which would enable me to regain the towpath west of Burghfield. The plan actually worked out, although I’ve previously walked the same route but in the opposite direction. It even gave me the opportunity to record two footpaths not shown on the OSM. These have now been uploaded to the map database. Apart from the shopping the other reason for choosing to walk the towpath was to view other occupied boats and see how effective their insulation was compared with our own. The method I used was to compare the amount of snow on the roof. 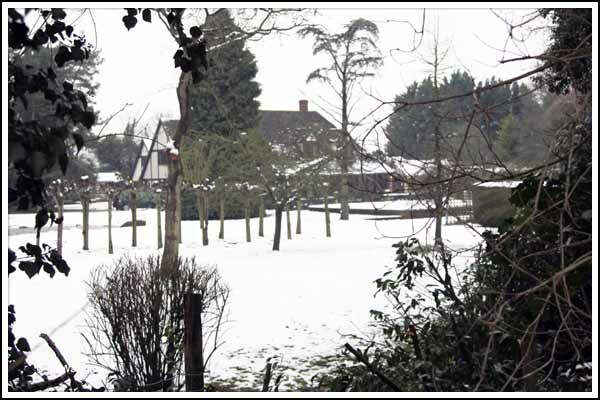 Less snow indicating more heat loss and therefore poorer insulation. 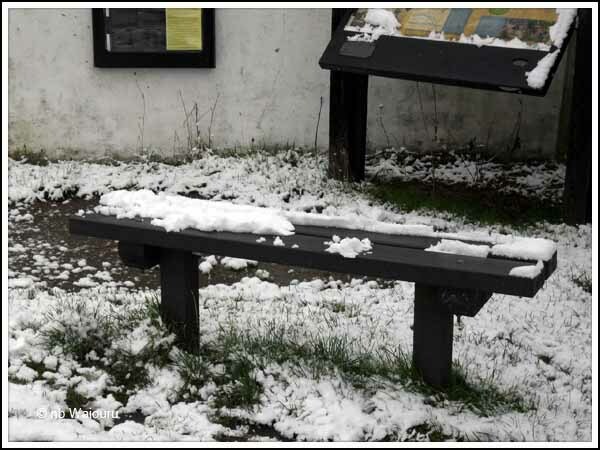 It was pleasing to see Waiouru was in the top 5% of boats based on the amount of snow. Or am I just gloating! 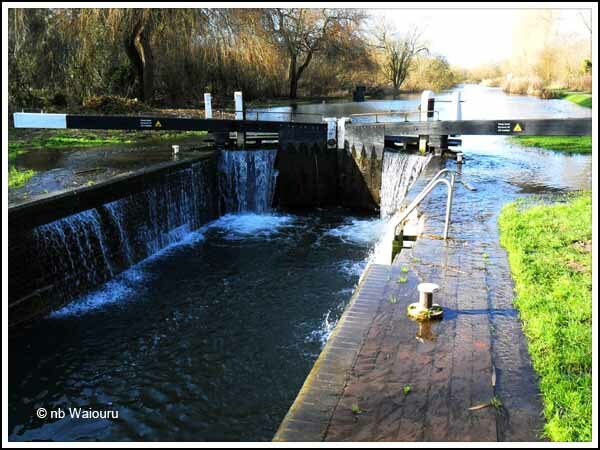 When I reached Reading I could see the water following over the top of the upstream gates on County Lock. It’s likely to be the reason why CaRT has closed it to boats. Interestingly, further downstream there was a widebeam in Blake’s Lock heading down to the Thames. The river didn’t conditions didn’t appear very different to when I was last at the junction of the K&A and Thames. 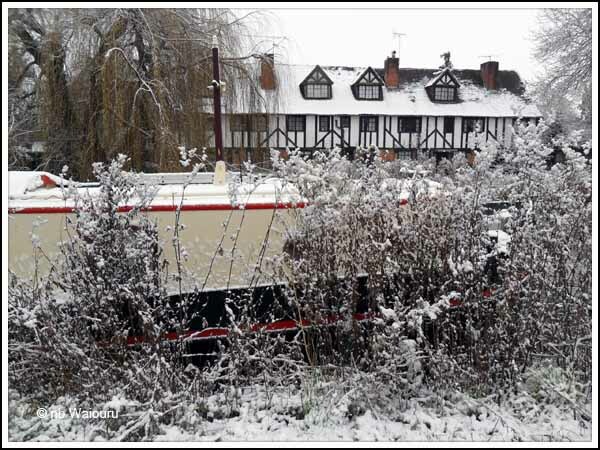 The only difficulty experienced during the walk was the icy conditions underfoot on the towpath from the outskirts of Reading through to the centre of town. I had to be very careful where I placed my feet to avoid assuming the horizontal position. 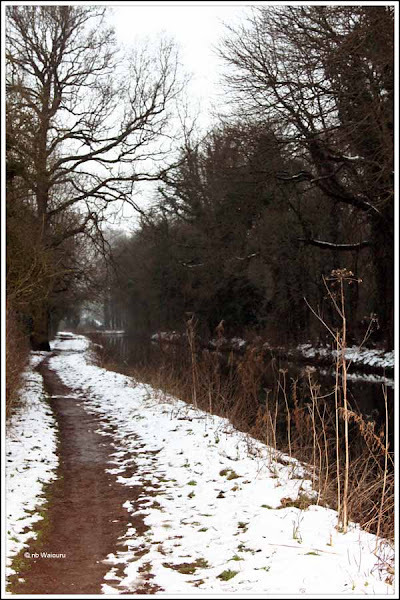 Early in the walk there was far more snow on the rural portions of the towpath making walking much easier. Rather than turn round and walk the 11 miles home I wimped out and used the senior’s bus concession card to make the return journey using the Jet Black 1 service. By the time I arrived back at Waiouru I had a serious headache. That’s when I realised I hadn’t had anything to drink since yesterday evening. A silly error allowing myself to become so dehydrated. Leaving without water was someting I’ve never done bush walking in Australia. Lesson learned! Friday - 6:00 PM. It started to snow. The first real snow of the season and the wife and I took our cocktails and sat for hours by the hatch watching the huge soft flakes drift down from heaven. It looked like a Christmas card scene. After 20 years of living in a hot and dry country it was very exciting and so romantic we felt like newlyweds again. I love snow! 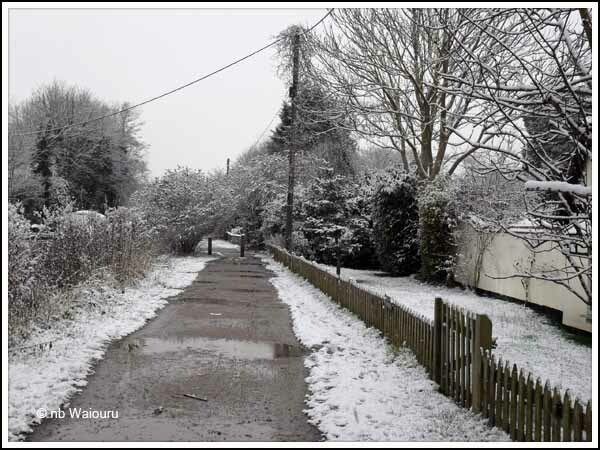 Saturday - We woke to a beautiful blanket of crystal white snow covering every inch of the landscape. What a fantastic sight! Can there be a more lovely place in the Whole World? Moving here and onto a canal boat was the best idea I've ever had. Swept and shovelled for the first time in 40 years and felt like a boy again. I did both the top of our boat and the towpath. 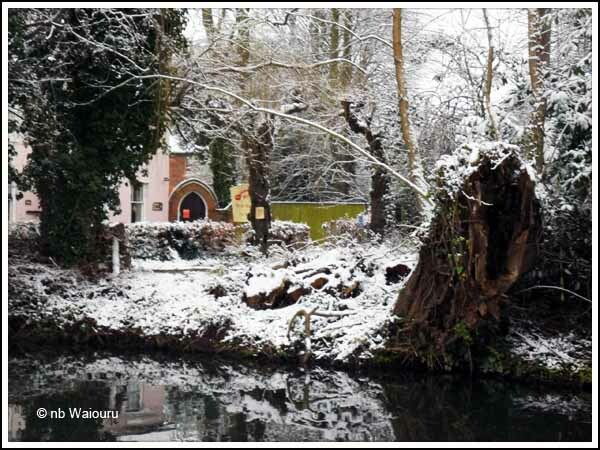 This afternoon the snowplough came along and covered up the towpath, so I got to shovel again. What a perfect life. Sunday - The sun has melted all our lovely snow. Such a disappointment. 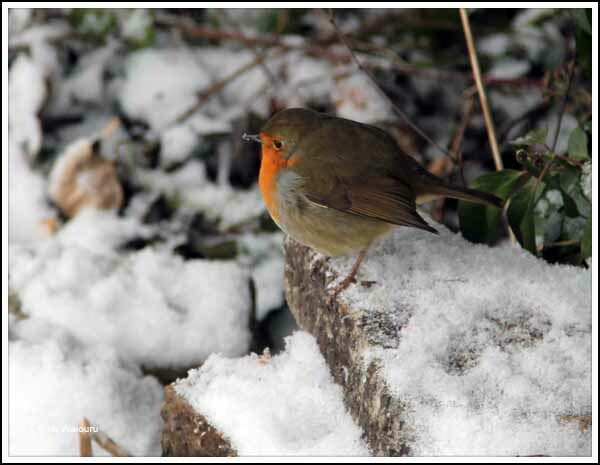 Our local friend, Bill tells me not to worry; we'll definitely have more snow and the canal may even freeze over. No snow in winter would be awful! Bill says we'll have so much snow and freezing weather by the end of winter, that I'll never want to see snow again. I don't think that's possible. Bill is such a nice man, I'm glad he's our friend. Monday - Snow lovely snow! Eight inches last night. The temperature dropped to -2. The cold makes everything sparkle so. 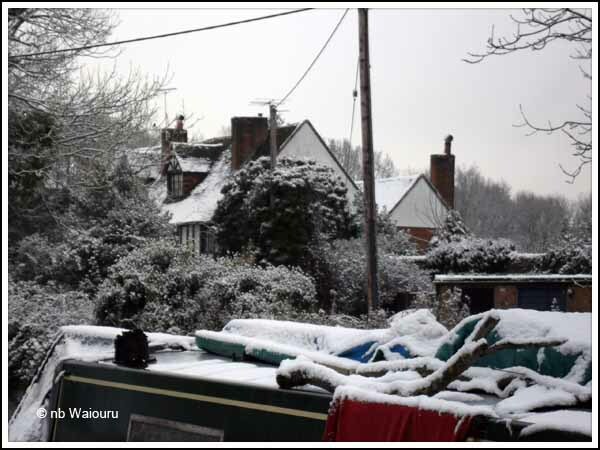 The wind took my breath away, but I warmed up by sweeping the snow off the roof of the boat and shovelling the towpath clear. This is the life! The snowplough came back this afternoon and buried everything again. I didn't realize I would have to do quite this much shovelling, but I'll certainly get back in shape this way. I wish l wouldn't huff and puff so. Tuesday - Twelve inches forecast. Bought two extra shovels and a second broom. Stocked the freezer. The wife wants a wood stove in case we can’t get resupplied with diesel. I think that's silly. We aren't in Alaska, after all. Wednesday - Ice storm this morning. 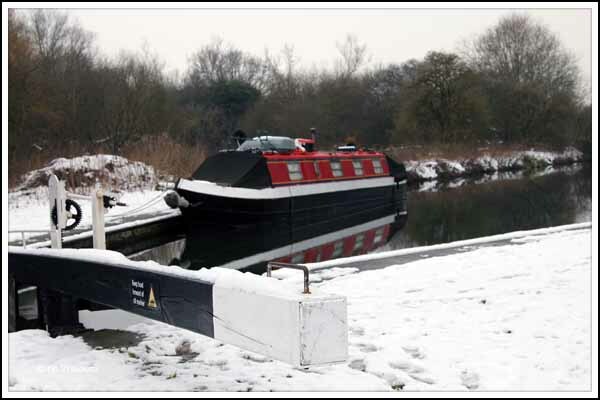 Fell on my ar** on the ice covering the towpath next to the boat putting down salt. Hurt like hell. The wife laughed for an hour which I think was very cruel. Thursday - Still way below freezing. Canals are frozen so we can’t go anywhere. We can’t refuel the boat or top up the water tank. Because the diesel tank is nearly empty the stove can’t be turned on. I had to pile the blankets on to stay warm. Nothing to do but stare at the wife and try not to irritate her. Guess I should've bought a wood stove but won't admit it to her. God I hate it when she's right. I can't believe I'm freezing to death in my own narrowboat. Friday – Walked a 2km round trip with a jerrican to get 20 litres of diesel so the stove can be used, but had another 6" of the damn stuff last night. More shovelling. Took all day. Damn snowplough came by twice. Tried to find a local kid to shovel, but they said they're too busy playing in the snow. I think they're lying. Called B&Q, Screwfix and Homebase to see about buying a petrol powered snow blower and they all claim they’re out of stock. Might have another shipment in March. I think they're lying. Bill says I have to shovel or CaRT will have it done and send me the bill. I think he's lying. Saturday - Bill was right about a white winter because 6 more inches of the white crap fell today, and it's so cold it probably won't melt till August. Took me 45 minutes to get all dressed up to go out to sweep and shovel, and then I had to pee. By the time I got undressed, peed, and dressed again, I was too tired to shovel. Tried to get Bill to shovel my section of the towpath for the rest of the winter but he says he's too busy. I think the ar**hole is lying. Sunday - Only 2" of snow today. And it warmed up to 0. The wife wanted me to decorate the boat this morning. What is she, nuts?! Why didn't she tell me to do that a month ago? She says she did but I think she's lying. Monday - Six inches. Snow packed so hard by people walking past on the towpath that l broke the shovel. Thought I was having a heart attack. Every muscle in my body aches…. even those I didn’t know I had. If I ever catch the SOB who drives that snowplough I'll drag him through the snow and beat him to death with my broken shovel. I know he hides around the corner and waits for me to finish shovelling and then he comes along at a hundred miles an hour and throws snow all over where I've just been! Tonight the wife wanted me to go to the local pub with her and have a roast meal, but I was too busy watching for the damn snowplough. Tuesday - Six more inches of the damn stuff tonight. Snowed in. The idea of sweeping and shovelling makes my blood boil. I hate the snow! Then the snowplough driver came by asking for a donation and I hit him over the head with my shovel. The wife says I have a bad attitude. I think she's a frickin' idiot. If I have to watch "It's A Wonderful Life" one more time, I'm going to stuff her into the microwave. Wednesday - Still snowed in. Why the hell did I ever move here? It was all HER idea. She's really getting on my nerves. Thursday - Temperature dropped to -3 and the pipes froze, no water for cooking or washing. Then the damned calorifier sprang a leak. The central heating now doesn’t work. Called the local marina for a marine engineer and had to wait 14 hours for him to arrive. He only charged me £400 to repair the system. Who said this boating would be fun and exciting! Friday - Warmed up to above -2. Still snowed in. THE B**** is driving me crazy!!! Saturday - Four more inches. Bill says I have to sweep the roof of snow or the boat will roll over. That's the silliest thing I ever heard. How dumb does he think I am? 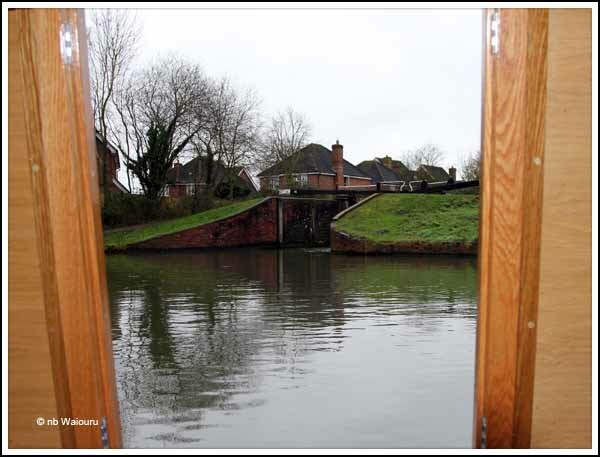 Sunday – Boat tipped over against the towpath breaking all the crockery and smashing a large dent in the side of the cabin. I beat up the snowplough driver and he is now suing me for a £1m---not only for the beating I gave him but also for trying to shove the broken snow shovel up his ar**. The wife went home to her mother. Nine inches predicted. Monday - I set fire to the boat. No more shovelling. Tuesday - Feel so good. I just love those little white pills they keep giving me. Why am I tied to the bed? 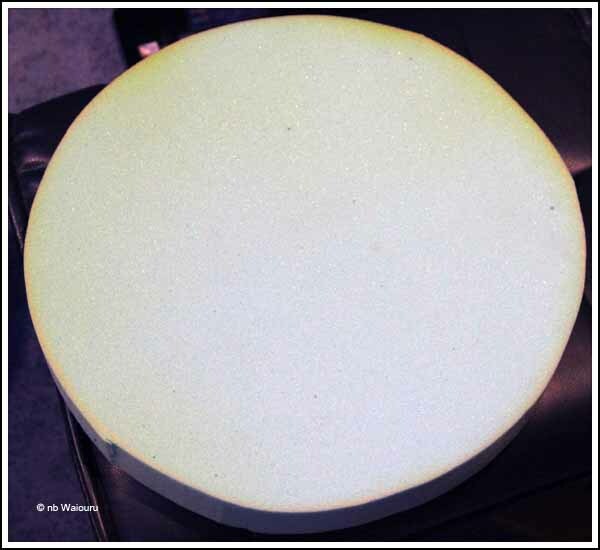 The Refleks stove has now been heating Waiouru for 24 hours and the result is quite noticeable. There’s far less condensation, however we have lost the warmth from the wardrobes and lockers previously supplied by the Hurricane. The next test is to set the Hurricane to run for an hour in the morning and evening. Primarily to provide hot water, but also to warm the bedding and stored clothing. After that the plan is to reduce (if possible) the Refleks output temperature to a base comfort level (say 17°C) and allow the Hurricane to “top up” the temperature to 19°C. 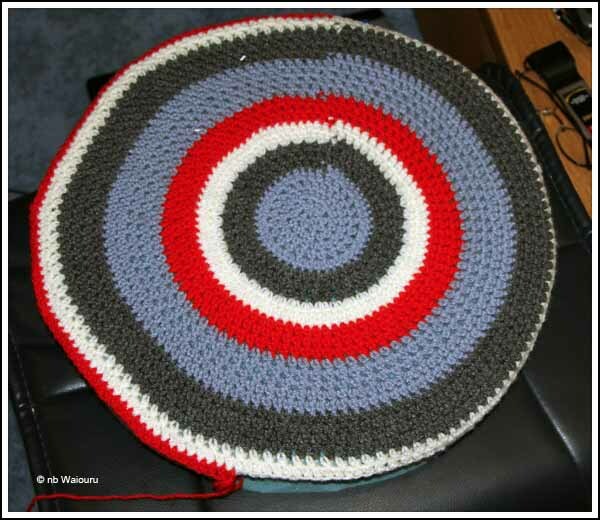 Jan has purchased a trivet from Lakeland. 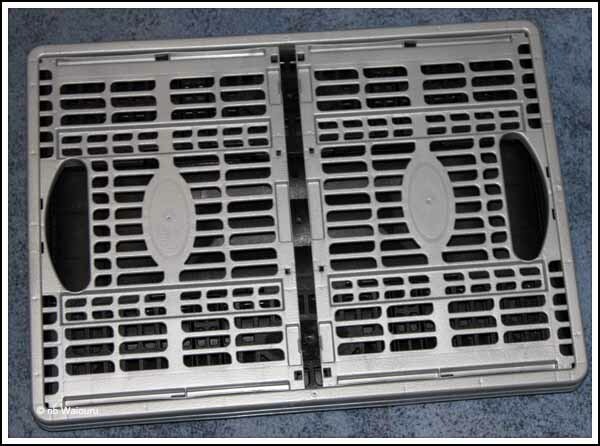 It consists of two joined perforated metal discs and rests on top of the Refleks hotplate. It’s designed to diffuse the heat from the hotplate and prevent the contents of the pot resting on it from burning. Today she cooked a casserole on the stove and everything appeared to work well. In the afternoon I went for a towpath walk towards Reading. The flooded fields to the south are now ice covered fields. The River Kennet in the foreground continues to have a strong flow. 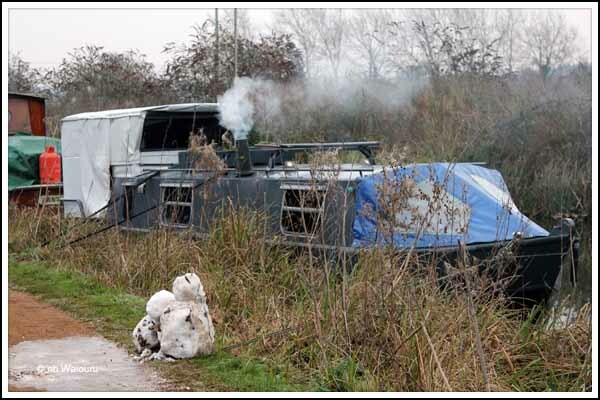 Many of the local boaters have been preparing for the forecast cold weather by topping up on coal and wood. As I passed this boater he was chopping more firewood. 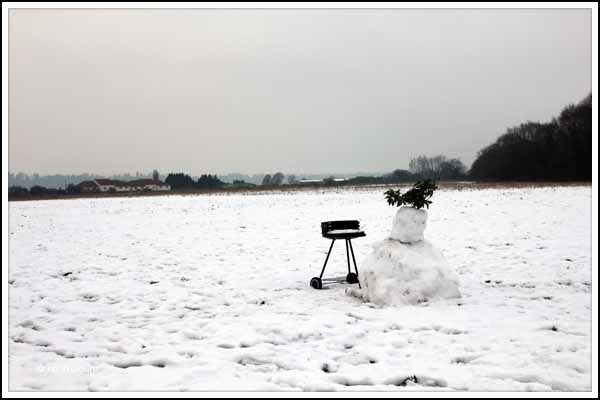 No doubt there will be more snow tomorrow so the snowman can be finished! We topped up Waiouru’s water tank this morning, but first the tap had to be unfrozen with hot water and then I had to remove the ice from the slot in the tank filler cap before it could be unscrewed. The toilet tank is empty and the diesel tanks full. Food stocks are also high, apart from the beer….. which is of concern! 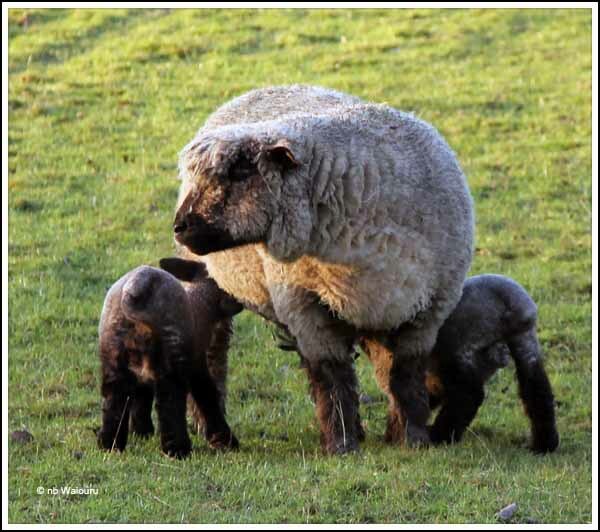 One of the local farmers has a field full of recently born lambs… all twins. I hope he has moved them into shelter today as I suspect they wouldn’t survive tonight’s snow and low temperatures out in the open. The other task completed during the day was to practice some more splicing. Some months ago we purchased six thin tubular rubber side fenders, each came with a 2 metre length of yellow polypropylene rope. I’ve now spliced the six length into two six metre lengths of rope with a loop at one end. We’re now prepared for the big freeze!